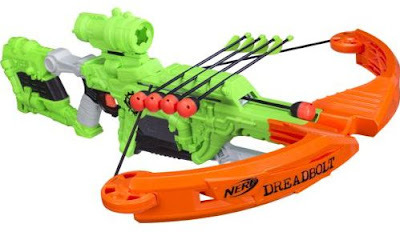 NERF Zombie Strike Dread Bolt Crossbow - Just $24.98 + FREE SHIPPING! Wow! Check out this NERF Zombie Strike Dread Bolt Crossbow from Academy Sports for Just $24.98 (was $49.99) + FREE SHIPPING for a Limited Time! Fight off the zombie horde with your closest friends using the NERF Zombie Strike Dread Bolt Crossbow. This crossbow comes with a detachable scope for zeroing in on your undead target and 5 Zombie Strike arrows to keep you prepared in battle. Store the arrows directly on the crossbow for easy access, and swing the priming lever backward and forward before pulling the trigger to fire with power and precision.